A short video with excerpts from our powerful and moving 2016 Srebrenica Memorial Day event at Durbar Court in London. 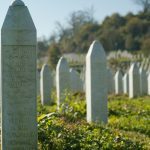 Our national events bring together people from all parts of the community to hear key political, religious and community influencers reflect on the lessons from Srebrenica. They provide a vital opportunity to send a strong message of solidarity with the victims and survivors of the atrocity, and to remind us that we must always be vigilant against hatred and intolerance. On Monday 11th July, high profile guests attended a solemn commemoration for Srebrenica Memorial Day at Durbar Court in the Foreign and Commonwealth Office. The service included testimony from Srebrenica genocide survivors Hajrudin Mesić and Nedžad Avdić, daughter of Bosnian refugees, Amra Mujkanović and addresses by key figures including Prime Minister of Bosnia, Dr Denis Zvizdić, Secretary of State for Foreign and Commonwealth Affairs, Philip Hammond MP and performances from Bosnian Soprano Aida Čorbadžić and Cellist Belma Alić.